There is a book that changed the way I think about food, making it, and having it in your house. The book is called An Everlasting Meal by Tamar Adler. Adler wrote a chapter about the sense of abundance and food. This chapter drove home to me how often I overlook something in my kitchen that is highly usable because it has morphed from its original state. Fruit too ripe to be eaten should become a tart, as their sugar is concentrated anyway. Wilted greens should be tossed with hot broth or hot pasta, as they will melt into them all the more willingly. Peels and ends of veggies, heels of parmesan can be thrown into hot water and made into broth. We don't see food that's not "perfect" anymore because we don't have to, yet we miss out on so many possibilities. My favorite thing to do on Sundays is a shop through my high street. Cheese shop, butcher, vegetable stand, italian grocery store. I buy a hunk of cheese, pungent and runny, a jar of bright green olives, or green pickles, a steak or a whole chicken, fillet of cod, bunch of kale, lemons, whatever is coming in from the soil, and a big loaf of crusty bread. I work my way through these things during my week, but I almost never get to the whole loaf before it goes stale. This is entirely on purpose, because I want to make my next batch of croutons for my crouton jar. I use croutons instead of crackers. I sprinkle them over sautéed greens, drop them into soup, top my sardines with them and use the final crumbs on whatever latest spaghetti I've turned out. I find crunch an essential element of my cooking and when I have croutons on hand, they'll find their way into most things that come out of my kitchen. I like tearing the bread, instead of cutting it, because the ragged edges crisp up more than a smooth edge. If you want these extra garlicky, you use garlic infused olive oil. You can also add any herbs or parmesan cheese to the bowl if you like as well. All of the amounts above are dependent on how much bread you're working with. You want enough garlic and enough oil to be able to reach each piece of bread. 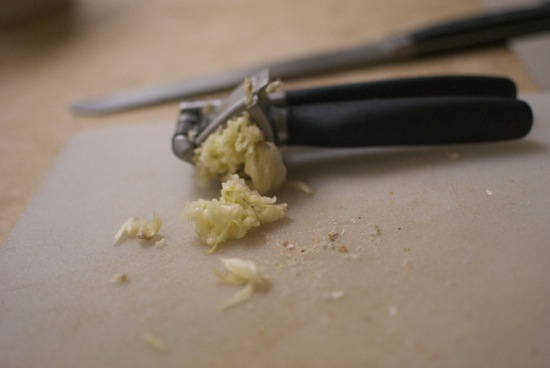 Put your garlic through a garlic press, or smash the cloves flat and chop them very fine. Combine the olive oil, garlic, salt and whatever else you're adding to the croutons in a big enough bowl that you can toss the bread comfortably. Add the bread and use your hands to toss the bread in the oil until each piece is well coated. Spread the bread on a baking sheet so that there is one even layer. If you have too much for that, you should bake in two batches. Pop in a 175C oven. Bake for 5 minutes. Toss the croutons and bake for another five minutes. Keep going with this until the croutons are golden brown and really crunchy. Let cool and store in a jar. Will keep in your pantry for several weeks.